Thanks to Kaylee Sherrod and COUNTRY Financial, Chicago Farmers Markets shoppers can bag their fresh goods in this year’s reusable canvas bag. 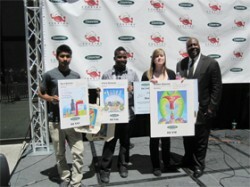 Sherrod, a junior from Steinmetz Academic Centre, won first place in the Reusable Bag Design Contest. She also received a $1,000 scholarship from COUNTRY Financial. Her design was inspired by the Pablo Picasso sculpture on Daley Plaza. Sherrod believes her design also shows the beauty and uniqueness of the city. Antwan Richmond, a senior at Lawrence Hall Youth Services, and Nevin Sanchez, a senior at Mather High School, were named runners-up. Each artist was awarded a $500 scholarship. Shoppers can pick up this year’s reusable canvas bag with Sherrod’s design throughout the season at various markets to carry home their fresh food. COUNTRY became a presenting sponsor for the Chicago Farmers Markets in 2008 and will continue sponsorship through 2013. Chicago Public Schools (CPS) high school students submitted their designs for the fifth annual contest. To see the winning design and other finalists, please visit www.CountryFarmersMarkets.com.